An unequal fight against cockroach terror. It takes one brave Carroty and You to survive in the veggie world. Game levels are divided into sprints of 3 levels each. Save one vegetable within each sprint. Advance through the levels using checkpoints. You get 3 with an option to buy more! Number of worlds (levels) has increased to 27! Improved UI and designs for closets, water pipes & kitchens. This time you try to save veggie friends while facing multiple challenges: dodging stalactites, climbing up a vertical water pipe to escape a flood of green slime (yuck! ), sailing a kitchen sponge and more. Try your hand at 30 brand new game challenges and exciting mechanics. Carroty is definitely pushing the boundaries! Are you in? Log in to Game Center to see real-time results on the player’s table and share achievements & rankings to social platforms to keep your friends updated as you master the game! Get a new look for Carroty by earning golden coins. 2 new looks added. 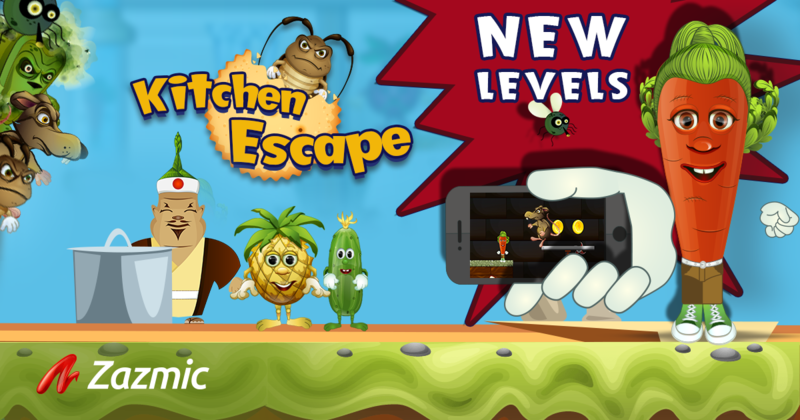 How can I play Kitchen Escape ASAP?? ?